Investing in a comfortable sleep can be hard especially if you have no idea what to look for in things like air beds. Some of the best inflatable mattresses are designed to enhance your sleep as well as reduce the discomfort that comes with different sleeping positions. It can help with back pain as well as the spinal alignment for a better sitting and standing posture. Besides, they are also highly portable and come with easy to store carrying bag. What Should You Look for While Buying Inflatable Mattresses? So, if you do not already own an air bed, then invest in one now. If you are lost for the best option, you can always start with some of the ones listed below. They come at an affordable price with instructions on use, maintenance, and storage. Air mattresses can be tricky when it comes to purchasing especially if you do not know what you are looking for. Here are a few tips and guides to choosing the best possible air bed for your home and road needs. This is the best air mattress for those who are always on the road due to its ease when it comes to package and portability. Besides, it also comes with an integrated cord storage to keep its power cord neat and tidy. This air mattress is highly durable and supportive as it remains firm and flat for you to enjoy your sleep. This is because it is designed with a comfort coil technology that is 40 internal air coils for an additional support system of up to 500 pounds of weight. Available sizes - Twin, King, and Queen. Height - 18" and 19" (vary on size). Limited warranty of 1 year. Material type - Eco-friendly PVC and top flocking. Moreover, it is considered as one of the best inflatable mattress as it has a patented one-click internal pump for easy and fast inflation and deflation. It can reach full inflation and firmness in less than 4 minutes and can be topped off quickly. It measures 78 by 58 by 19 and has a sure-grip bottom that prevents it from unwanted slides. 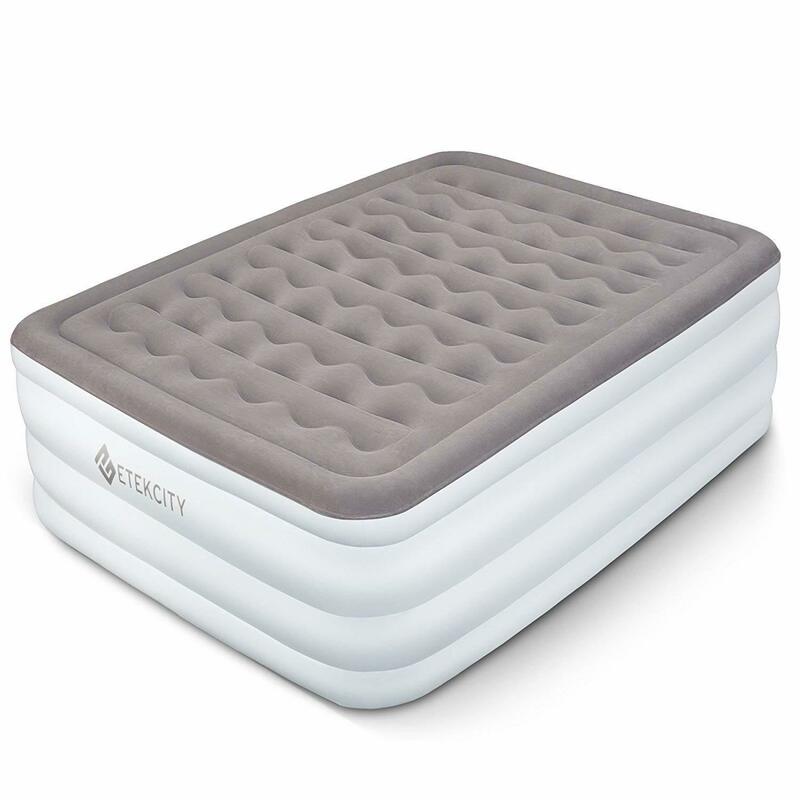 In relation, it is a double-height airbed with dual chamber construction and a multilayer 15 gauge puncture-resistant materials for enhanced durability. Besides, it has an extra thick waterproof flocked top for added comfort and durability. It comes with a 1-year guarantee. This is one of the best inflatable beds for those with back issues. It can easily reduce back pain caused by different kinds of sleeping positions to ensure you have a restful night. This is because it has a firm and comfortable sleeping surfacewith sturdy edges. Besides, this air bed has the most stylish bed skirt when compared to other inflatable beds. Apart from making the bed attractive it also keeps you warm and well-relaxed. Perfect for people with back pain. Risk-free satisfaction guarantee of 60 nights. Moreover, it has extra laminated vinyl material that prevents the air bed from stretching too much even with constant inflation and deflation as well as body weight. It comes with a spacious and highly portable carry bag that you can use for a road trip. This air bed comes with a 1-year warranty and a 60-day risk-free satisfaction guarantee. So say goodbye to sleepless nights and back pains and get this inflatable bed now. You won’t regret it. This is one of the best inflatable mattress as it has 43% thicker vinyl and comes with a built-in two-way pump. This means you can inflate it with its built-in pump or external pumps. Besides, it can also get rid of any back pain often associated with sleeping positions. In relation, you can always control its level of firmness by adding air when needed. It is very easy to set-up and deflates much faster. Besides, it comes with a carry bag for convenient portability. Limited warranty of 3 months. This king size inflatable bed measures 82 inches long, 74 inches wide and 19 inches high, making it ideal for 6+ foot individuals. This air bed is covered with a 90-day warranty. But it functions as expected with the inflation lasting even up to 2 weeks without losing any air. So, improve your sleep with this king size inflatable bed and start enjoying your sleep more often. This is often considered as an ideal and best inflatable air mattress as it can meet the needs of the whole family from kids to the elderly. It has a soft flocking layer and a built-in pillow for enhanced comfort level. In addition, it has an extra thick water resistant comfort quilt top that ensures you sleep soundly and stay warm all night long. Moreover, it has a coil-beam construction with a very user-friendly built-in pump that makes it inflate and deflate with the turn of an automatic knob. It can inflate the air mattress in less than four minutes and deflates if faster for a quick and easier packing. Available sizes - 76" x 38" x 20", 80" x 60" x 20", 84" x 72" x 20". Material type - Eco-Friendly PVC Fully Flocked. It measures 80 by 60 by 20 inches with a maximum weight capacity of 600lbs. Besides, it comes with a 1-year guarantee and is perfect for home use as well as road trips. This is ideally the best air mattress for tall and heavy individuals as it measures 80 by 60 by 22 inches and can carry up to 650 pounds. It is quick to set-up and comes with a built-in pump as well as a manual valve for external pumping in case there is no electricity. Besides, it can inflate in less than 5 minutes and comes with a built-in power cable compartment to ensure it does not clutter the room. In addition, you should always ensure the control dial is turned fully to inflate or deflate to ensure maximum efficacy. Available size - 80 x 60 x 22 in. Package included - 1x mattress, 1x carry bag, 1x user manual, and 1x vinyl plastic repair kit. Moreover, it is also considered as one of the best inflatable air mattress due to its double layer construction with a puncture-resistant material that ensures it maintains its form. It also has water flocked top to keep the surface dry and a PVC underside to prevent any unwanted sliding. Besides, the comfortable flocking top and PVC are eco-friendly and stable, making it feel like a real bed. This air mattress is highly portable and comes with a convenient carry bag. Its skid-free base also enhances its stability and reduces sliding. It comes with a 1-year warranty and life support from Etekcity. When it comes to inflating an air mattress, you should pay attention to some details like package folding as it will make folding it up again very much easier. You can start with unfolding its sides on a flat surface area with plenty of space for the bed to expand. Depending on its make an air bed can come with a built-in pump, an accord attached to a remote pump or a valve in which you place the pump. If it has a built-in pump just twist its knob to inflation and after it is filled twist it towards the direction that closes the air. But if it requires a separate valve just twist the valve open and place the pump nozzle in the hole and allow it to fill. Always remember to close the valve to prevent air from escaping. You can check its firmness but if you prefer a softer bed you can always let some air out. Air mattresses are the best way to expand your sleeping capacity and provide space for impromptu guests. And given their high-level of portability, you can take them almost anywhere. You just have to deflate and store after use. Here are a few quick tips on how to sleep well on an air mattress. Conclusively, you should always have an air bed in your home. This can be of use to your guests and also come in handy when you are planning a road trip. So, invest wisely when it comes to buying the best inflatable bed as it can determine whether you sleep comfortably or not. Likewise, you should be acquainted with some its basic features as well as functionality before making the purchase.